That said, I sincerely applaud your efforts to push the envelope of traditional gaming. I thoroughly enjoy your short game, The Graveyard, I revisit it frequently on my old G4 (PPC) iBook. I know you have experience writing universal binary games, and I think there are many who would enjoy a Mac version of “The Endless Forest”. Just an aside, meant to explain why a Mac version could be so popular, not as any sort of slam on Windows users: you only need look as far as the photography industry, the film industry, and various graphical art industries to find that creative types gravitate to the Macintosh platform. Mac OS X itself, as well as the computers that run it, is truly innovative and powerful. People who recognize and appreciate the innovations of Apple Inc. will also likely recognize and appreciate the innovations of your software company, and financially support your efforts. We would love to make more games for Mac OSX. The only reason why we don’t is that there is no development tool for games on Mac that is as suitable for artists as the tool we currently use on Windows. That tool, Quest3D, has enabled us to make our games. Without that tool, there would be no Endless Forest, or The Path. But that tool, or anything like it, does not exist on Mac OSX. The Graveyard was built with Unity. We plan to make more things with it in the future, and release them for Mac. But programming in Unity is not nearly as “creative” as it is in Quest3D (script-based as opposed to visual). So we are limited to building simple projects with it. Now, if anyone could make a Quest3D viewer for Mac, we would be set. But, indeed, funding being limited is an understatement, I’m afraid. I’d love to be able to join the community, but it seems that though I play regularly and have a registered deer, I cannot log in. Attempts to do so give me the following error: Error -32700: Parse error. Not well formed. Please post problems like this on The Endless Forest forum. Somebody there might have the solution. I totally agree with TJ!!!!! Its 2009 and I’d LOVE to join. I am an art FREAK, and the only reason I don’t constantly draw and play games like this is because I have homework. PLEASE PLEASE PLEASE, find a way to make this for Mac. Anything. PLEASE. There is a simple way to make this work on Mac. It’s called money. Do you have some? Or you could try Wine. I think the point that tjniels presented was very true, the majority of people in the creative arts industries are on mac, i myself am doing a btec national diploma in art and design and am on my macbook! I do have a pc in the house but it wont run the endless forest for some reason, i have named my deer but im yet to be able to play!! Its a long-shot but would mac maybe help fund it? it is relevant to many of its buyers after all. Would the Endless Forest run on Bootcamp on Mac? 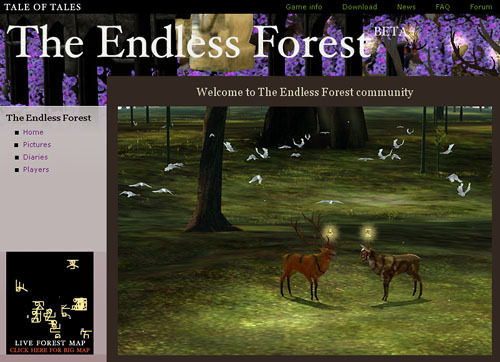 Yes, The Endless Forest runs fine on Windows via Bootcamp on a Mac with a good videocard. I downloaded the Path and it worked on my Mac no problem, so I’m really disappointed that I can’t get The Endless Forest for Mac too. Terrible shame. I hope you guys can work that out in the near future! We’ve asked Transgaming to port it. But The Endless Forest was harder than The Path. And it’s a free project, so we can’t pay them for porting. Bootcamp is the only option. Oh, I understand, but it doesn’t mean I’m not still disappointed about it. I could do bootcamp, but loading it is a hassle, and I wouldn’t want a Windows OS for any other reason. Next Next post: The Path in Shojo Beat!